Leading up to Christmas, we're counting down each day with the best players (or managers) to wear numbers 1-25 for the Yankees. The list includes Hall of Famers, recent stars, title-winning managers and fan favorites that have donned pinstripes over the last 115 years. He was the mastermind behind the most recent Yankees dynasty and guided the organization to four World Series titles in five seasons. In his 12 seasons at the helm, Joe Torre led the Yankees to a 1,173-767 record, a .605 winning percentage, 12 postseason appearances and 11 straight American East division titles. Before he took over the Yankees, Joe Torre was a nine-time All-Star who batted .297/.365/.452 with 2,342 hits over 18 seasons. Torre spent his time playing in the Braves, Cardinals and Mets organizations before transitioning behind the bench for those three teams. He entered his role with the Yankees with an 894-1,003 record as a manager, but overcame some doubt and became the Yankees' second-winningest manager, behind only Joe McCarthy. Torre was able to build off the team's Division Series loss in 1995 under Buck Showalter and lead them to a World Series title in his first season in 1996; their first title in 18 seasons. After falling to the Indians in the 1997 ALDS, Torre and the Yankees cruised to championships in 1998, 1999 and 2000, establishing them as the 'Team of the Decade.' The Yankees won 299 regular season games, including a then-record 114 wins in 1998 and 33 postseason wins during that three-year span. Torre is a two-time AL Manager of the Year, winning the award in 1996 and 1998. Torre also brought the Yankees to two World Series appearances in 2001 and 2003, which featured dramatic postseason victories against the D-backs and Red Sox. He became the first person in baseball history to win 2,000 games as a manager and collect 2,000 hits as a player. 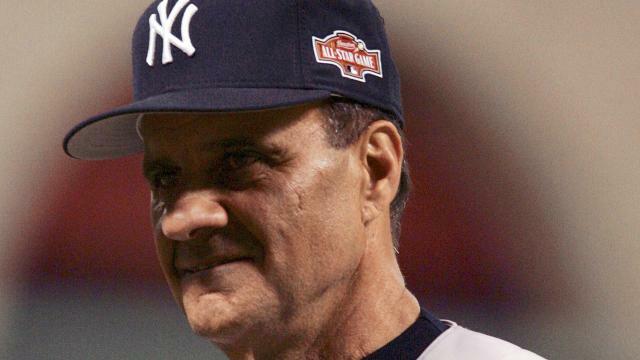 Torre also had an unflappable persona in his ability to manage numerous big personalities between Derek Jeter, Roger Clemens, Alex Rodriguez and many others during his time in the Bronx. Torre's era with the Yankees ended after they lost to the Indians in the 2007 ALDS. He was named the Dodgers manager later that offseason and remained there until he stepped down in 2010. He later accepted a role as the executive vice president for baseball operations for MLB Commissioner Bud Selig. During the 2013 season, the Yankees retired Torre's No. 6 and enshrined him into Monument Park with a plaque. He was elected into the Baseball Hall of Fame in 2014 alongside fellow managers Bobby Cox and Tony La Russa. Torre finished his career with 2,326 wins, putting him in fifth place on the all-time manager wins list.